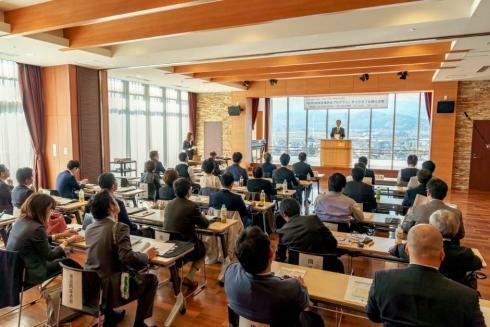 Shinshu University has embarked the "Next 100-year-old Enterprises Program" as a new local vitalization project for the next generations, aiming the settlements of core human resources through practical recurrent education. In this program, Shinshu University offers practical recurrent education and the position of Research Fellow (visiting researcher) to human resources based in the Tokyo metropolitan area who have sophisticated expertise and career profiles, being interested in new work life in Nagano. Shinshu University makes a good matching between the key persons in the metropolitan and the local companies in Nagano which participate in this project to realize their sustainable growths working with Research Fellows. This project is subsidized by the Small and Medium Enterprise Agency in FY2018 as a new type of local revitalization scheme aiming the settlements of core human resources. 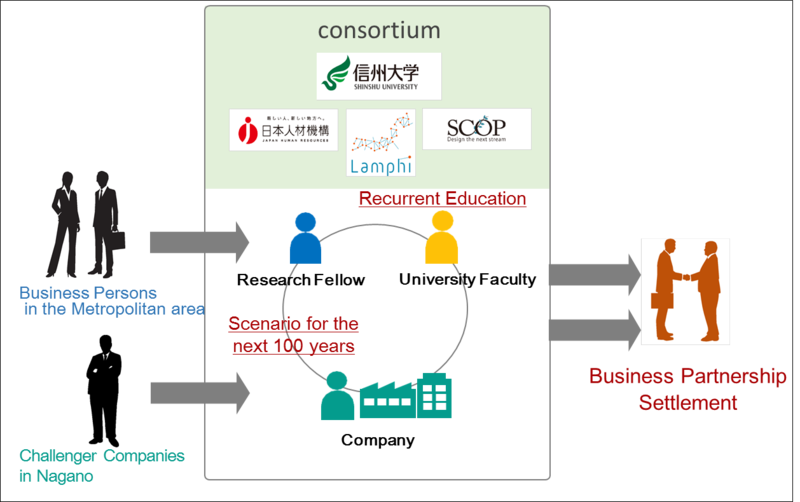 Shinshu University, serving as a hub, has formed a consortium with Japan Human Resources Co.,Ltd., Lamphi, and specified non-profit corporation SCOP, and matched 8 companies and 9 Research Fellows. For the period up to March 2019, Research Fellows will be offered practical recurrent education at Shinshu University while they engage in the assigned companies and analyze underlying issues to make the future scenario that will bring the company to last for the next 100 years. After recruiting Research Fellows in August and matching Research Fellows and companies one by one in October, on November 11th, 2018, the kick-off event of the "Next 100-year-old Enterprises Program" was held and Research Fellows and participant companies got together. In the 1st session, following after the explanation about the program, the Conferment Ceremony for Research Fellow took place and a keynote speech was given by Mr. Taneo Nakamura, the former president of Isetan Mitsukoshi Holdings and the representative facilitator of Shinshu Club. In the 2nd session, a panel discussion was held and Dr. Kunihiro Hamada, President of Shinshu University, and Mr. Ogi, President of Japan Human Resources Co.,Ltd., expressed their enthusiasm for this program, from then on a group discussion about making next 100-year-old enterprises was held by Research Fellows, participant companies, and Shinshu University faculties. This project was featured on NHK World on December 13th, 2018. The kick-off event of the "Next 100-year-old Enterprises Program"